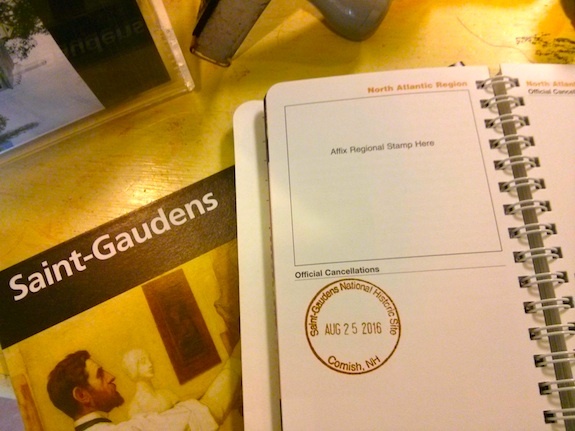 Yesterday, August 25, 2016, I had the pleasure of activating Saint Gaudens National Historic Site with Barry Green, W1JFK and Frank Towle, KC1AAQ. It was my fourth time at this delightful jewel National Park Service (NPS) property. It was even more special because the three of us were there on the 100th birthday of the National Park Service. It was created by presidential order on August 25, 1916. The three of us decided to do an activation of this site weeks before. Frank had activated it with me two months earlier and it was Barry’s first NPOTA activation. Barry is an expert DXr and does SSB. 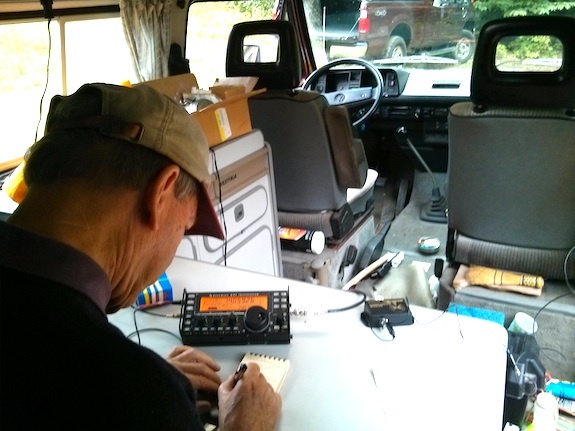 Frank gravitates to digital HF radio and I’m the CW junkie. So the three of us were able to work together in an attempt to make a handful of chasers happy on this historic day. But as with all best-laid plans, the ionosphere had other things in mind for us. We all struggled to make contacts over the three hours we were on the air. With the help of gracious spotters and us transmitting endless CQs, the three of us garnered only 40 total contacts. Barry and I got the requisite minimum of ten QSOs each to officially activate, but Frank didn’t make it even though he logged an operator in Liverpool, England. 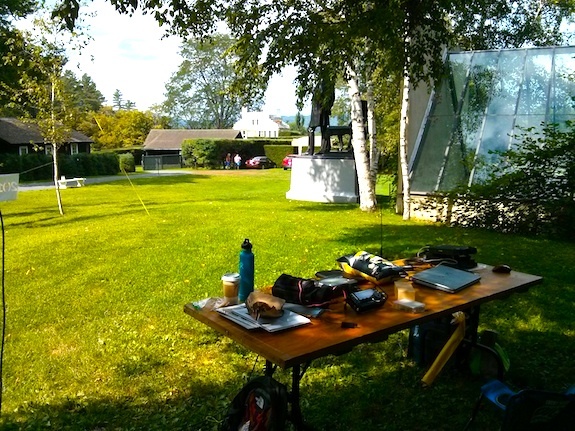 My Elecraft KX3, BioennoPower Powerpack and 29-foot wire with a 9:1 unun allowed Barry and I to communicate. Frank brought his own radio, power supply and computer to make his digital magic possible. As usual, the Bionenno Powerpack did the trick. Even after three hours of nearly continuous operation, the LCD screen still showed the lithium-iron-phosphate battery as full! 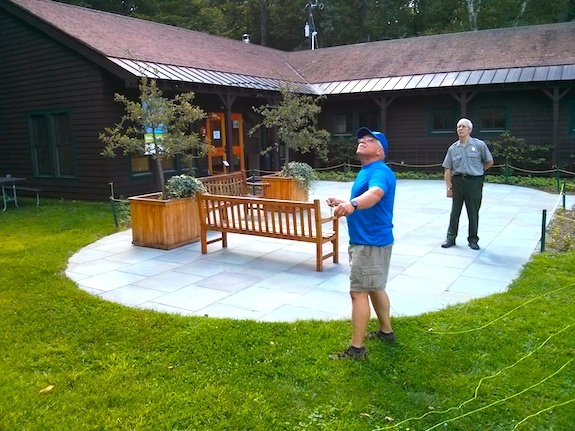 It was a busy day at Saint Gaudens as the park was open to the public for free. While we were very visible to the park visitors as they explored the visitor center, none came over to inquire why a fluorescent green string and black wire were doing hanging down from the tree just above us. While I didn’t realize it at the time, I got an omen from the band god as I was attempting to get my halyard line up into the trees. It took me four attempts to get the perfect branch and my first errant throw came dangerously close to hitting the greenhouse you see in the above photo. Barry and I switched off doing SSB and CW and after we both gave it two shots, a few rain drops started to descend from the sky. It was about 1:35 pm and we had decided to leave at 2 pm to get back home by 4 pm. Water hitting expensive electronic equipment was reason enough to call it a day. We packed up and Rick the head ranger invited us inside for some birthday cake. We graciously accepted. What a surprise to find champaign there as well! Barry, Frank and I all agreed it was a day well spent. 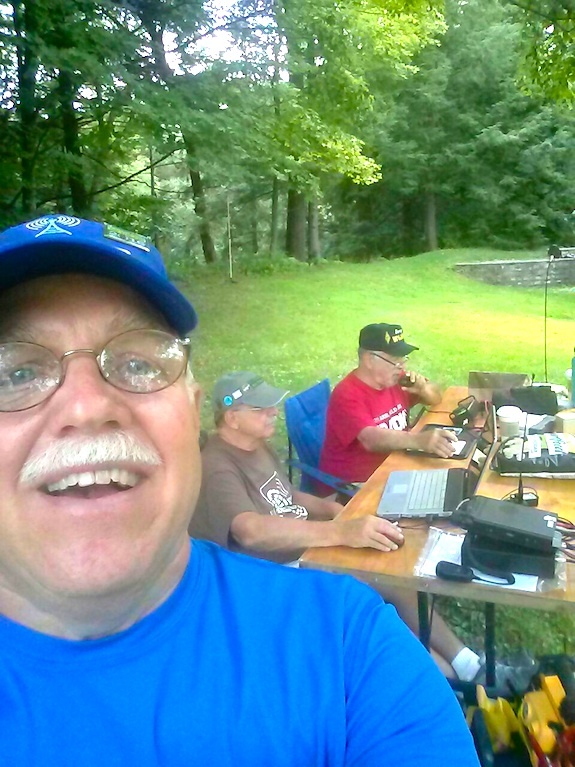 Thanks to the NPS and the ARRL for making the fun NPOTA event possible. 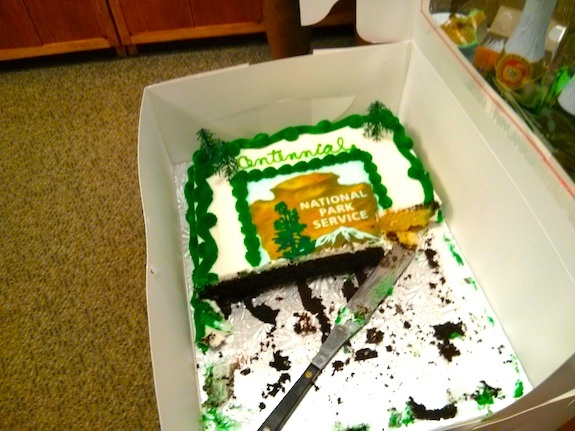 Happy Birthday National Park Service! 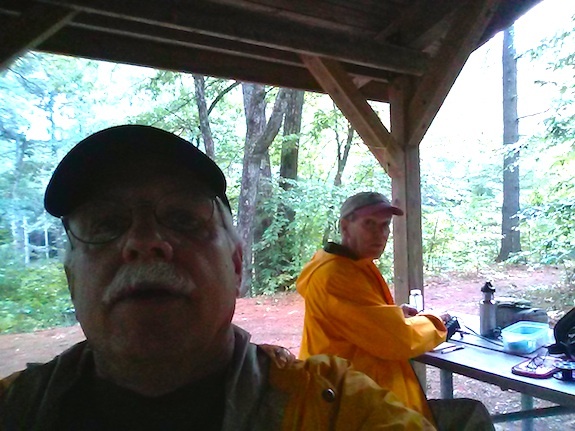 Jim Cluett, W1PID, and I decided to operate together for the annual Flight of the Bumblebees. 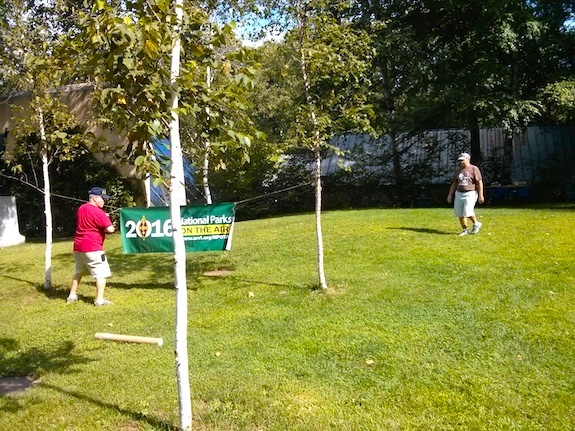 It’s a low-intensity and fun contest. Operators like Jim and myself are some of the bees because we go out into the wild and operate portable. All who are participating in the event want to put as many bees in their logbooks as possible because each bee comes with a 3X multiplier. Jim and I met for lunch and caught up. We hadn’t seen each other for about a month because I went on a ten-day trip to the Midwest and then came back to work day after day on my outdoor deck reconstruction project. “There’s no rush getting on the air because the bands have been horrible,” Jim said while we munched on healthy sandwiches. “As the day goes on, we should have better and better luck.” He assured me. It was decided to try to operate from a nice covered shelter at Profile Falls in Bristol, NH. For some reason we keep forgetting this exact location is the Black Hole of RF Death. We also discovered it’s a great place to have your car become a smash and grab statistic. In the shelter was a nice retired man who volunteers to watch over the cars that are in the parking lot for those wanting to hike to the falls. After forty-five minutes of frustration, I had only two contacts here and I believe Jim had three. On a normal day in that time he could have had ten or twenty. We packed up and decided to head to some land I own just four miles east northeast of Profile Falls. 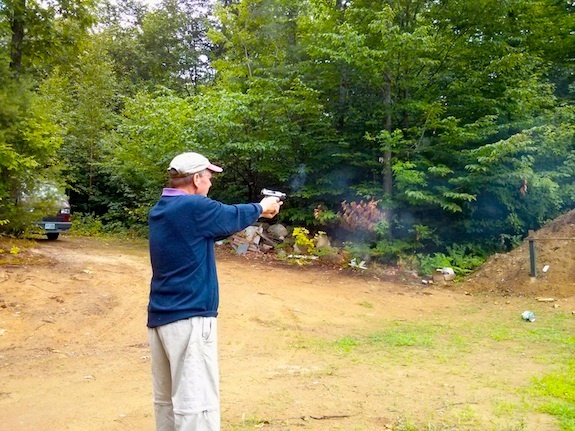 Once there, we decided to vent our frustration throwing lead and copper at a 3/8-inch solid steel gong. It worked. Soon we were in much better spirits. With only about forty-five minutes left in the contest, we decided to get back on the air. Twenty meters was alive! I made six contacts in about 24 minutes and Jim made, I think, about nine or ten. Our Bumblebee scores were pathetic, but that’s not what counts. We pegged the fun meter mixing invisible radio waves with puffs of gunpowder smoke!